Contrails or vapor trails are condensation trails and artificial clouds made by the exhaust of aircraft engines or wingtip vortices which precipitate a stream of tiny ice crystals in moist, frigid upper air. 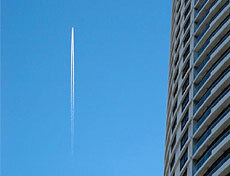 According to the U.S. Air Force, jet contrails form above 33,000 feet when hot engine exhaust momentarily condenses ice crystals into pencil-thin vapor trails that quickly vanish like the wake behind a boat. 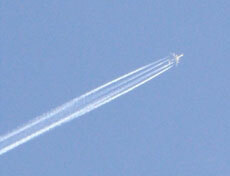 Contrails are not to be confused with Chemtrails.